Sometimes there are special occasions that calls for extra celebrations. Whether you have to book a bus for your child’s birthday party or a luxury limousine for their high school Prom. We help our customers celebrate those special occasions in style with our outstanding fleet of transportation services. Rent Long island prom limos for making your prom ride with luxury. Our fully licensed and skill fully trained drivers offer so discreet services that you will not even know that they are there. Let us treat you like loyalty the next time a special occasion arises. Prom is finally here!! The day that you’ve been waiting for all your life. The work that you’ve put in for the past twelve years is finally here and your prom is a time to forget about your school work and tests. Prom is a night of endless possibilities and it gives everyone attending it a chance to make a great impression. From their formal attire to the vehicle they show up in. Why not make your night extra special with a rental prom limo Long island service. We provides a safe travel to high school students on prom night. Parents, why not celebrate your child’s success with luxury by getting them a prom party bus Rental. Whether you are a parent looking for a responsible driver to transport your child, or trying to meet the expectations of the prom night for your son or daughter, a limo ride is a way to go. With competitive limousine Rental prices for prom, you can be assured that you’re getting the most ride for you money which is worth every buck. Your prom night is supposed to be with wonder and glamour. An ordinary vehicle ride will just won’t do. Let us get you to your main event in style and safety in one of our elegantly appointed limousines. Party buses are also a fun choice for groups wanting to start the party as soon as they leave the driveway and continue all the way home after the big dance. Our party buses offer a range of services according to your preference to set the party atmosphere. 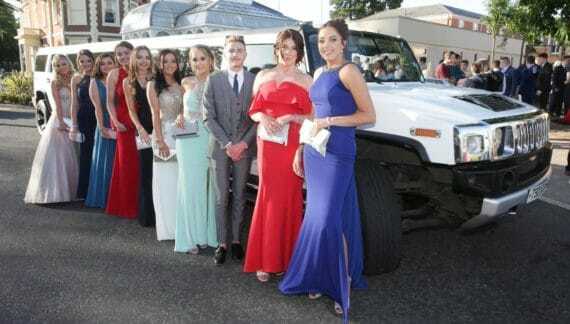 We are dedicated to provide a safe, stylish and luxurious experience with our prom limousine services. We are glad to provides estimates and prom packages. We offer 10%off for the proms in weekdays of May and June. Parents are welcome to come and see the limousine services themselves. 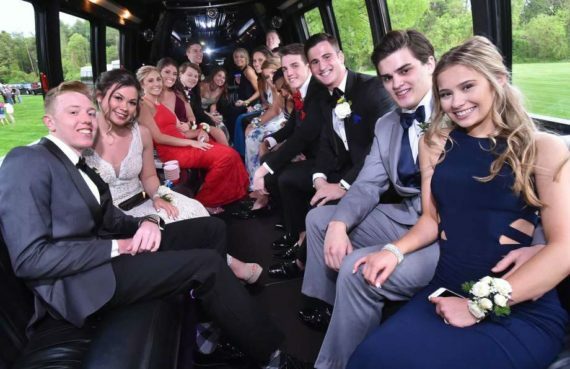 Our wide selection of Long island prom limousine and buses provide you and your guests a complete prom transportation solution. Each one of our limousines are wonderfully designed and can accommodate all your prom limousine transportation needs with just one phone call. We understand that having your child in someone else’s care can leave you feeling uneasy and disturbed. You can rest at home knowing that we take extra precaution with your child into consideration. We have drivers that are professional with years of experience that are training in safe driving party bus limos. Why hire a prom limo from Li Party Rides? We are all about making a grand entrance and we are proud to offer the finest prom limos and limo party buses. We strive for excellence which means that your prom limousines will arrive on time and meticulously clean on the day of your prom. As parents, you have the peace of mind knowing that your young adults will be safely transported to their event by a professional chauffeur who will have the responsibility of the safety of your young adult. 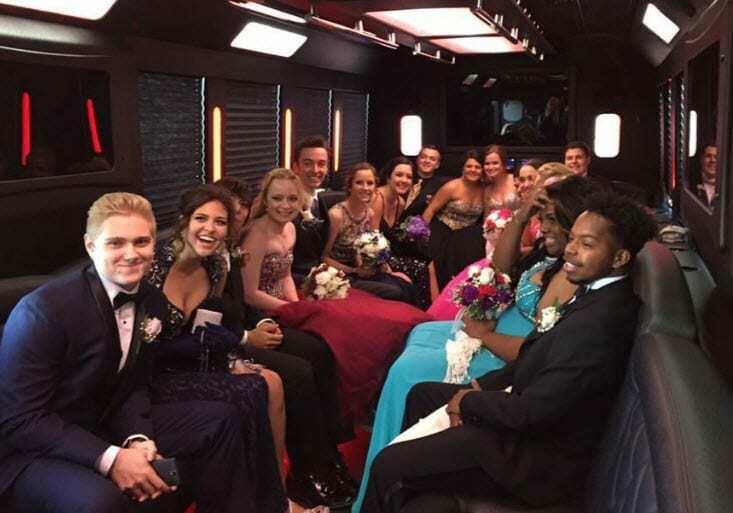 Whichever prom limo you choose, we are certain that you find the perfect limousine which will make you and your friends stand out from the crowd. From home pickup to the destination and back to the return drop off, your child’s safety is our responsibility. You have the control of the schedule of the prom; just let us know what works best for you. Give liparty rides a curfew. The chauffeur will abide by any rules you set forth and will make sure to pick to pick and drop your child at designated locations and time. Check the limo services that it is reputable. Make sure the company has right credentials. We have been in business for years so we assure you with a 100% security of your child. Remember to sit back and relax. Our services have drivers with proper training and licensing. They know it very well how to keep things under control. We take pride in our excellent customer service that will leave you with a night to remember. We will work diligently to ensure you have the perfect night full of celebrations. We offer party bus limos which are top notch and have exceptional amenities. This truly is a great way to show your child that how proud you are of them for their great achievements. You can contact us at any time and we will be happy to give you more options and even share some tips on how you can make your night a truly unforgettable experience. The demand for transportation during the spring season can be overwhelming due to proms and weddings. Plan to meet up for pre prom photos at one location for memories. Remember to book your ride for a few extra hours to ensure you have time to have a great time. Make this High School Prom one that everyone will remember and one that everyone is going to want to experience again sooner than later!